“A thoughtfully observed travel memoir and history as richly detailed as it is deeply felt” (Kirkus Reviews) of South America, from Butch Cassidy to Che Guevara to cocaine king Pablo Escobar to Charles Darwin, all set in the Andes Mountains. The Andes Mountains are the world’s longest mountain chain, linking most of the countries in South America. Kim MacQuarrie takes us on a historical journey through this unique region, bringing fresh insight and contemporary connections to such fabled characters as Charles Darwin, Che Guevara, Pablo Escobar, Butch Cassidy, Thor Heyerdahl, and others. He describes living on the floating islands of Lake Titcaca. He introduces us to a Patagonian woman who is the last living speaker of her language. We meet the woman who cared for the wounded Che Guevara just before he died, the police officer who captured cocaine king Pablo Escobar, the dancer who hid Shining Path guerrilla Abimael Guzman, and a man whose grandfather witnessed the death of Butch Cassidy. Collectively these stories tell us something about the spirit of South America. What makes South America different from other continents—and what makes the cultures of the Andes different from other cultures found there? How did the capitalism introduced by the Spaniards change South America? Why did Shining Path leader Guzman nearly succeed in his revolutionary quest while Che Guevara in Bolivia was a complete failure in his? 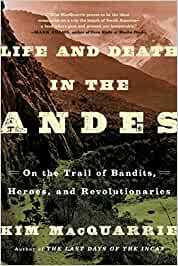 “MacQuarrie writes smartly and engagingly and with…enthusiasm about the variety of South America’s life and landscape” (The New York Times Book Review) in Life and Death in the Andes. Based on the author’s own deeply observed travels, “this is a well-written, immersive work that history aficionados, particularly those with an affinity for Latin America, will relish” (Library Journal). Start reading Life and Death in the Andes on your Kindle in under a minute. Kim MacQuarrie is a four-time Emmy Award–winning filmmaker and award-winning author who has lived and worked all over the world. Educated in the US and France, he lived for five years in Peru and spent some of that time living with a recently contacted tribe in the Amazon jungle, only 100 miles from Machu Picchu. He is the author of Life and Death in the Andes and The Last Days of the Incas, as well as three illustrated books about Peru. He currently divides his time between the US, Peru, and Thailand. Visit him at KimMacQuarrie.com. Some interesting stories here. I read this in Sth. America and glad I did. It history miXed with some fact and tries to find the truth in fiction of the Andes. Great historical memoirs of famous and infamous South American characters, told by a master storyteller. Beside the obvious inclusion of Pablo Escobar and Che Guevara, to the people of the floating islands in Lake Titicaca who still sacrifice to their gods, Mr. MacQuarrie presents an insightful and entertaining look at the huge South American continent and its people. 5.0 out of 5 starsAn incredible resource of information about South America presented in a "can't put it down" manner. I lived in Peru for many years and Kim Macquarrie's book "The Last Days of the Incas" was my constant reference book during that time period. Needless to say, I was ecstatic to learn of his writing "Life and Death in the Andes" and pre-ordered many months before the release on December 1st. I've been glued to the book since. Kim has the ability to share so much knowledge and detail on cultural, historical, anthropological, geographical, environmental, etc aspects but in a way that leaves you not wanting to put the book down and as if you are along on a great adventure story. He is not only a leading authority on all things South American, but a true adventurer as well,so his descriptions are amazing and keep you turning pages but at the same time learning so, so much. This book reminds me a lot of a few of my other favorite books on South America; "One River" by Wade Davis, and "Running the Amazon" and "Savages" by author Joe Kane. But if I was headed to South America and was to take along just one, it would be "Life and Death in the Andes" due to the scope and variety of stories contained within. A must buy book for anyone interested in South America, adventure, history, cultures..the list goes on! I thoroughly enjoyed this book---and I learned a lot! This well-researched book was very informative on many events that had occurred in South America that I knew very little about. I found the details of how the Shining Path, a terrorist group in Peru, and the biggest drug cartel of Medallin in Columbia, developed and ended. I also liked reading about Darwin and how he came about with his ground-breaking ideas of evolution. I truly want to visit the Galapagos Islands some day! WOW! I didn't know about the floating islands and the lifestyle on Lake Titicaca. The intelligence of the author came through many times and especially with his discussion of Kon Tiki and the theories that surrounded the exploration done by Thor Heyderdahl. Who influenced who? The natives from South America visiting the Polynesian Islands or the Polynesians coming the South America.? This is a well-written book, easy to read and understand and I recommend it. What a super super book. I went to Peru first in '09 and then went back again and this time included Boliva in Oct. 2015. I read MacQuarrie's The Last Days of the Incas after fist trip. That should be required reading for any and all going to Machu Picchu. This book should be required of anyone going other areas of Peru and to Bolivia. I have been to many of the places he covered and really enjoyed re-living my experience. We did get to see the Ice Maiden of Ampato in her current resting place in Arequipa. Cusco is my most favorite city which was not on the itinerary for latest trip. Sorry that I have not been to the Center for Traditional Textiles. Maybe reason for another trip there. There is a similar place in Bolivia. We also got meet and talk with Paulino Esteban - what an experience and so glad he is in this book. I thought I learned much on my trips but MacQuarrie gave me so much more. I am recommending it to the group on the Oct. trip and other like-minded friends. The histories and cultures of all these South American countries are so deep and varied and fascinating. I only hope MacQuarrie keeps traveling and writing. 5.0 out of 5 starsexcellent read that will drive you to new interests! I loved Kim's book about the last days of the Incas, I read it after my first big international trip. I went to Peru and it filled in lots of gaps for me, made me want to go back again one day. I was so excited for this book to come out, seemed right up my alley. It's basically 9 or so short articles about interesting things in South American history. It's very well written, you can feel the passion he has for that part of the world. It will make you want to buy a new book after each chapter. He lightly delves Into these stories so you'll probably want to go on and do some more research after you finish. I can't think of a better way to recommend a book. You'll read it and be thirsty for more. The only gripe I have is: I think it could have been a great travelogue as well. I would have loved a few paragraphs here and there about the actual road trip down the west coast of the continent. he could have tied things together really well and made a masterpiece. But, that's a small gripe. I loved this book and I hope Kim keeps writing. Excellent book. Beautifully written. I read slowly, savoring, and was sad the book ended, which I think, is always the ultimate compliment - wishing a book wouldn't end. For such a large subject, spread across a continent, Life and Death in the Andes is an intimate book. The author gracefully juggles a crosscutting of history - both ancient and recent - along with memoir. No easy task. But MacQuarrie does it masterfully, breathing life into history's characters along the way. A wonderful read. Highly recommended.